Tomorrow night (14th March), an intellectual discourse (ID) will be held at Main Auditorium KOS at 8.30pm. The forum will be moderated by Muhammad Zaki b. Sukery, vice president of GAMIS. 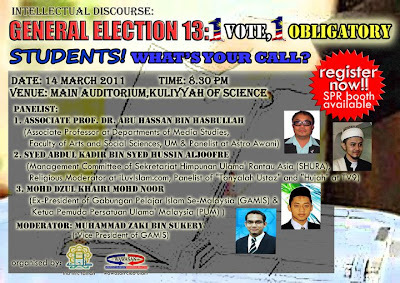 So, dear mahallah Talhah residents and IIUM community as a whole, let us attend and hear the discussion about elections and why it is so important to exercise our rights as voters. That's right, it is our right and amanah (responsibility). Organized by: Training & Development Bureau, MTRC and IIUM Wawasan Club. p/s: an SPR booth will also be opened during the forum, so feel free to register as eligible voters for those who are 21 and above. And it may be best and more convenient if students already have a photostate copy of your ICs. Thank you.